Better than a thousand days of diligent study is one day with a great teacher, says a Japanese proverb. At their best, educators teach us to think and ask questions. 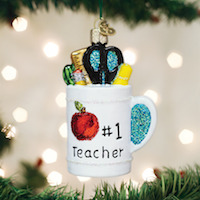 Say thanks to all the amazing teachers you know with this delightful and cheery ornament. This ancient appliance has been around since Biblical times and has been used in construction, medicine and cooking. People around the world have used this versatile tool to mash all sorts of things, and it continues even today. The Erlenmeyer flask was named after the German scientist who created it back in 1860. 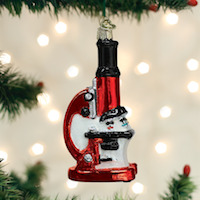 This conical flask is great for mixing concoctions, while minimizing spillage. If you aren't a scientist, you can always use one as a flower vase, or a decanter for your favorite refreshing beverage. The earliest microscopes were called flea glasses as they were originally used to study small bugs. The first microscope was invented by Hans and Zacharius Jansen in the 1600s and has gone through numerous improvements over the centuries. Today, we can see an entire universe of minute organisms, thanks to this ingenious device. Since the 1590s, this word refers to "an avid reader," eagerly devouring book after book, a person devoted to studying, from Atticus Finch to Hermione Granger & Jo March. Whether in print or on an e-reader, who doesn't love to snuggle up with a good book? 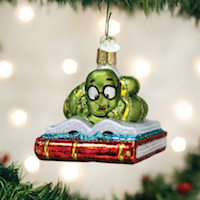 Our blown-glass bookworm Christmas ornament makes a wonderful gift for every voracious reader you know! 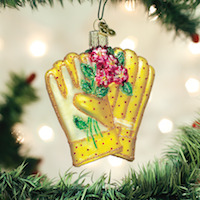 Spend any amount of time in your garden, and you will quickly grasp the need for a great pair of gloves. Whether you're digging in the dirt, pruning roses, pulling weeds or transplanting herbs, there's a garden glove designed to make the job easier. Knitted by hand and made with love. For centuries, people have knitted yarn to create functional and stylish pieces of clothing and accessories. 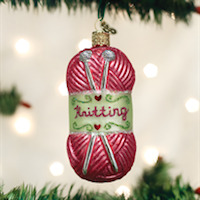 As a creative and beautiful art form, knitting creates personalized, beautiful and richly patterned products. Knitted pieces can be as basic as a washcloth and as intricate and delicate as lace. Photography is one of the most popular hobbies today. Camera technology has allowed amateurs to spectacularly capture moments and images with professional quality. 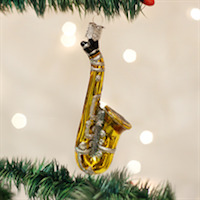 Celebrate the photographer in your family whether it be mom, dad or a professional with this camera ornament. A chef's hat is also known as a toque. Chefs began wearing these hats to blend in with the monks, by wearing similar shaped hats, as they sought refuge in the monasteries. 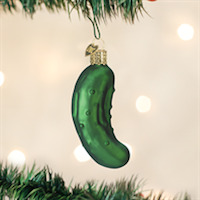 Chefs were being persecuted for their creativity. The hats have remained a symbol of the profession. Graduation from high school or college is an important accomplishment. Receiving a diploma means the recipient has successfully completed their course of studies. 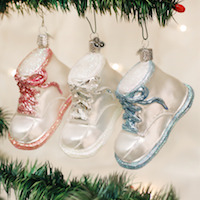 The glass diploma ornament makes a perfect keepsake to commemorate this event. Successfully completing a course of studies to graduate from high school or college is a significant accomplishment. This beautiful hand-crafted glass "Congrats Graduate!" 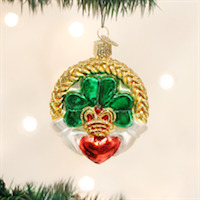 ornament make a perfect keepsake to commemorate this important event. The little red school house was a common sight in small towns in the United States in the 1800's and early 1900's. With few books or individual chalkboards, all students from the first grade through the eighth were tutored by the same teacher in one simple room. 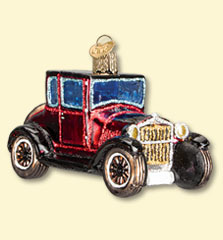 Commemorate or brighten any school event with this beautiful glass school back pack ornament. It was carefully mouth-blown into a finely crafted mold. Then a solution of liquid silver was poured inside. 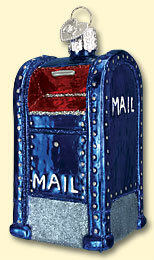 Finally, it was hand-painted with many brightly colored lacquers and glitters for you to enjoy. The pencil is used by millions of people everyday to accomplish a huge variety of tasks. From homework to sketches by students, to building plans and complex physics equations by professionals, the humble pencil is a small tool that can get big jobs done. 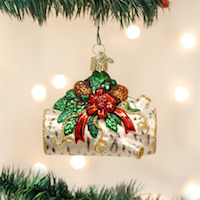 A beautiful, ripe apple is a traditional gift to a favorite teacher. 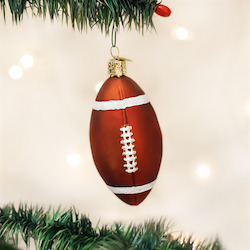 It started years ago in New England when teachers were usually paid in foodstuffs. 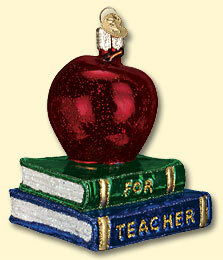 This glass apple, perched on a stack of books, makes a perfect thank you gift or keepsake for a special teacher. "Neither snow, nor rain, nor heat, nor gloom of night stays these couriers from the swift completion of their appointed rounds," is engraved on the U.S. Postal Service building in New York. 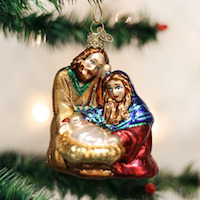 Americans send over 2.1 billion Christmas cards each year as a way of expressing how much they care for their family and friends. For centuries, firefighters have used helmets to protect their heads while risking their lives to extinguish flames. While the shape and materials have changed throughout the time, the fireman's helmet has always been a symbol of these heroes. 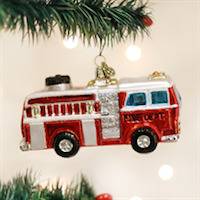 What could be better than that childhood favorite - a shiny, red fire truck! Toy makers often turned real-life items into toys for children, so they could learn as they played. 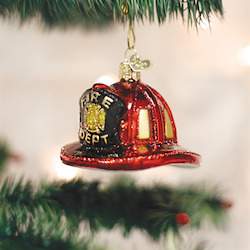 A child could imagine being a heroic fireman bravely battling danger. Originally intended to cover a nurses hair for hygienic purposes, the nurse's cap became an object of pride for nursing students receiving a cap was an important achievement. No longer mandatory, it still symbolized the nursing profession and is a distinctive symbol representing service to others. An ambulance is a vehicle used to transport ill or injured people. It contains life-support equipment and is staffed with well-trained medical personnel, so patients receive specialized care while being transported to the hospital. The Claw Hammer is one of the oldest and most used tools. 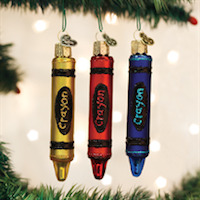 From construction sites to home projects, they are a true necessity. Carpenters view hammers as a personal tool, an extension of themselves, and are loyal to their favorite. 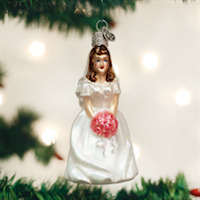 Add a little glamour to your Christmas tree with this beautiful glass nail polish bottle ornament. It was carefully mouth-blown into a finely crafted mold, then a hot solution of liquid silver was poured inside. 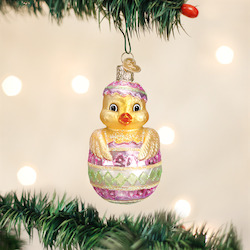 Finally, it was delicately hand-painted with bright lacquers and glitters for you to enjoy! 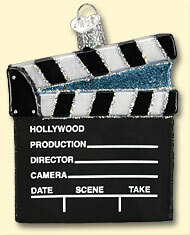 When making films, a Director's Board, or clapboard, is used to help align the sound with the film. Combined with a chalkboard for the details of the next take, the clapboard is filmed briefly at the start of the take and traditionally has diagonally striped lines to ensure a clear visual of the clap. 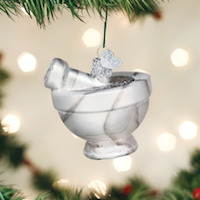 Celebrate the special talents of the artist with this beautiful glass ornament. It was carefully mouth-blown into a finely crafted mold. Then a hot solution of liquid silver was poured inside. 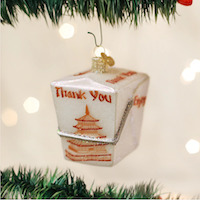 Finally, the ornament was delicately hand-painted with many brightly colored lacquers and glitters for you to enjoy!